Goalbook Pathways Math Assessment Item Progressions have been optimized with model student responses that implement multiple means of representation. They also allow students to apply math in real-world contexts. We are excited to announce that we have added NEW math assessment item progressions for grades 3–6 . 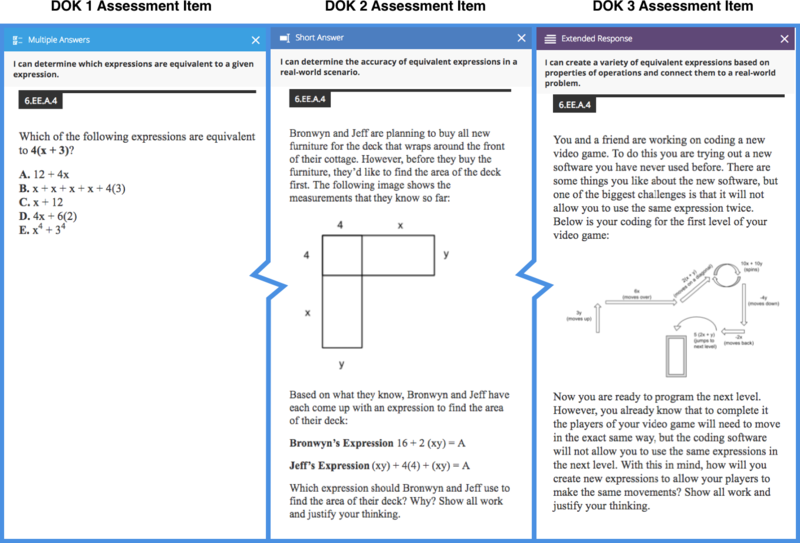 There are now over 80 new assessment items that cover many math topics. A notable enhancement to these new pages is the model student response section. Not only are there multiple exhaustive responses but the responses at each DOK level give teachers an accurate representation of what they can expect from students at DOK levels 1–3. The assessment item progressions that have been introduced for grades 3–6 math serve as an instructional design model for teachers to create learning experiences that go beyond building subject knowledge to building practices that support mathematical thinking. One of the newest grade 6 assessment item progressions in the area of Expressions and Equations (6.EE.A.4 DOK 1, DOK 2, DOK 3) clearly exemplifies this concept. As the items connected to the standard progress from DOK 1 to DOK 3, it is less about removing scaffolds and more about increasing the cognitive load on students. The DOK 1 item simply requires students to recall and apply a mathematical procedure. The DOK 2 item moves beyond recall and has students apply their knowledge to a real-world problem. The DOK 3 item requires students to design solutions for a series of complex problems. By the time students are working on DOK 3 level problems, there is a multiplicity of solving methods that they can apply and just as many solutions. At this level, students should be creatively applying their mathematical skills and knowledge to problem solving. Deepening mathematical understanding in students means giving them more opportunities to practice; however, the practice should be focused on building numerical flexibility rather than rote repetition. This means students should frequently engage in activities that require them to model their thinking. True modeling is a process that uses math to represent, analyze, make predictions, or otherwise provide insight into real-world phenomena (SIAM Society for Industrial and Applied Mathematics). …create learning experiences that go beyond building subject knowledge to building practices that support mathematical thinking. Authentic problem solving has little to do with the memorization of equations; it should encourage students to make decisions based on the set of practices that define their knowledge. That is the definition of mastery of the standards at the deepest level of complexity. 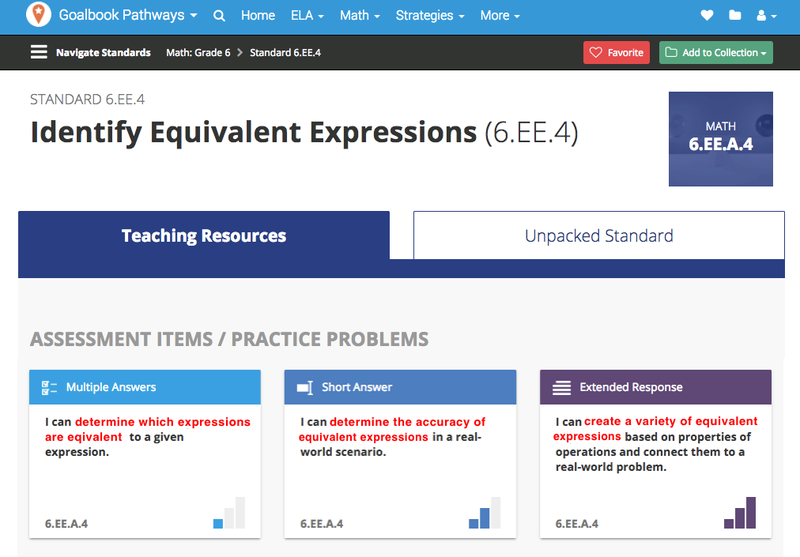 Each of the new items reinforce that definition with the types of problems that are presented in assessment progressions as well as the model student responses connected to each item. The model student responses connected to assessment item progressions serve as a criteria for success for teachers to set expectations according to DOK levels, but they also serve as a tool to clearly see the requisite skills students need to master the standard. The model student justifications, in particular, explain the why and the how of student responses so that teachers can use them to make informed instructional decisions as they design learning experiences. Learn how to access the NEW math assessment item progressions in Goalbook Pathways! Follow our publication Innovating Instruction to stay up to date on all of our product updates and to read about the impact Goalbook is having on our district partners. Boaler, Jo “Mathematical Modelling and New Theories of Learning” Teaching Mathematics and its Applications, Vol. 20, Issue 3, 2001,p. 121–128.